Still the “Other”? Are Chinese and Asian Americans Still Seen as Perpetual Foreigners by the General Public? The Committee of 100’s landmark 2001 survey of public attitudes toward Chinese and Asian Americans revealed, in the words of then C-100 Chairman Henry Tang, “the common perception of Asian Americans as ‘permanent foreigners.’ Asian Americans are seen to be disinterested in engaging fully in American society, and Chinese Americans in particular are suspected of being more loyal to China than the U.S.” One of the results, according to the Asian American focus groups held in conjunction with the 2001 survey, was that Asian Americans held back from full political participation in American society. The 2009 survey polled the general public and an oversample (an additional sample of a sub-population) of Chinese Americans, so we can see the perceptions and experiences of both groups. Are Chinese and Asian Americans still the “Other,” viewed as “perpetual foreigners”? Looking at C-100’s 2009 survey, the answer is both yes and no. Chinese and Asian Americans are seen by a vast majority of the American public as fitting into American culture, a perception shared even by those who show a high level of prejudice toward those of Asian descent. Seven in ten believe the increase in Asian immigrants over the past decade has been good for the country, up from 49% in 2001. Generally, Chinese and Asian Americans are described in glowing terms, with far fewer negative characteristics coming to mind. 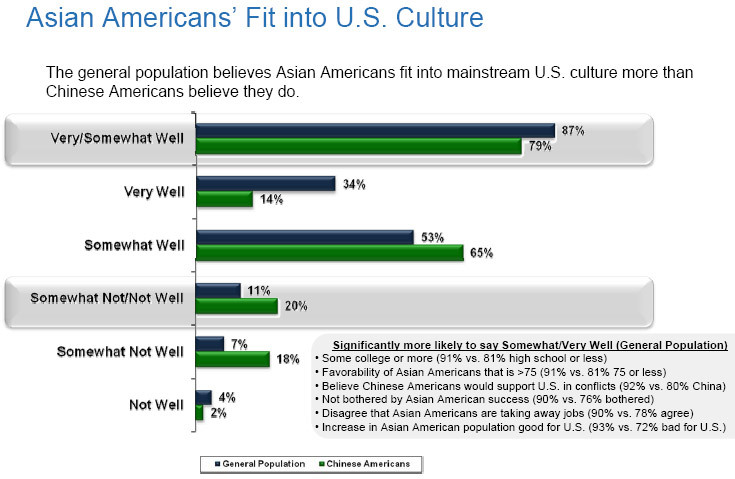 Yet, as also found in the 2001 survey, there remains a significant minority representing from one-fifth to two-fifths of the population who feel Asian Americans have too much influence in government and the U.S. high technology sector, are overrepresented on the college campus, and were more loyal to their country of ancestry. These individuals feel that the increase in the Asian American population has been bad for America, and they are bothered by the success of Asian immigrants and feel that they are taking jobs away from Americans. In a heartening sign that American society is becoming more tolerant, among those who expressed the highest number of negative views about Asian and Chinese Americans, 76% said that they would not disapprove of a marriage by a close family member with an Asian American. The question of loyalty is a complex one. A third of the general public (34%; 2001-32%) agreed with the statement that “Chinese Americans are more loyal to China than to the U.S.” However, 45% of the public thought that “Asian Americans are more loyal to their country of ancestry than to the U.S.” Why there would be such a difference in attitude toward Chinese Americans and Asian Americans isn’t clear and needs further exploration. 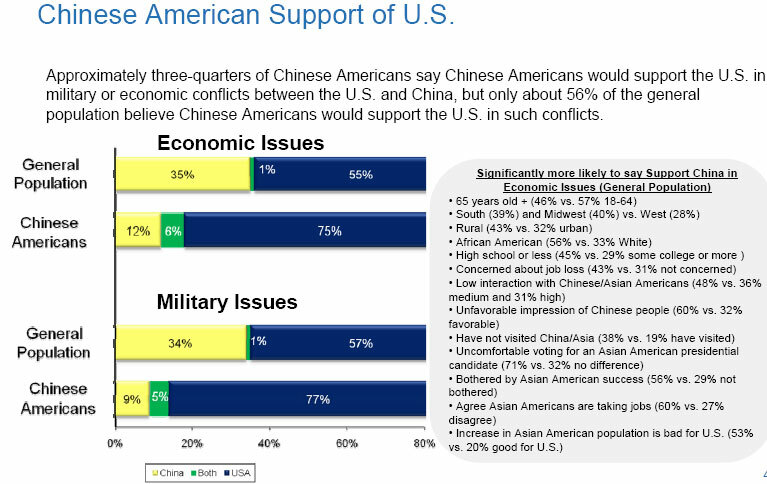 For a similar question, “Generally speaking, when it comes to issues between the U.S. and China, in your view are Chinese Americans more likely to support the U.S. or China?,” approximately one-third of the general public felt that Chinese Americans would support China over the U.S. in economic (35%) or military (34%) conflicts. However, more than one-half held the opposite point of view, believing that Chinese Americans would side with the U.S. (55%--economic, 57%--military). When Chinese Americans were asked the same question, their responses were more complex: the vast majority believed that on the whole Chinese Americans would support the U.S. in both economic (75%) and military (77%) conflicts; a smaller number thought China would be supported in economic (12%) and military (9%) disputes; and even fewer (6% economic, 5% military) thought both the U.S. and China would be supported by Chinese Americans! What is clear is that Chinese Americans feel that they as a group are more “loyal” to the U.S. than many of the general public believes them to be. When 42% of non-Chinese Americans say that Chinese Americans “should think in more American ways,” it is instructive to look at how they actually see themselves. The largest number of Chinese Americans, 48%, said they felt they were equally Chinese and American; 39% said they thought of themselves as more American than Chinese, and only 12% said they identified as more Chinese than American. This relatively strong identification as American is impressive given that of the Chinese American respondents, only 35% were born in the U.S., a proportion very close to the Chinese American population as a whole (37% native-born). This question taps cultural rather than national identity, no doubt, since native-born Americans of Chinese descent might also feel equally Chinese and American. As for retention of Chinese language, 85% of Chinese Americans said they could speak Chinese. How much experience does the average American have with Chinese Americans? The survey revealed that one-third of the general population has little or no interaction with Chinese Americans at work, in their communities, or socially, and approximately a quarter of the public said they had never interacted with Chinese Americans in these settings. However, another one-third say they interact with Chinese Americans at least few times a week, and even more (40%) say they interact with Asian Americans this often. As one might expect, many Americans have difficulty distinguishing between Chinese Americans in particular and Asian Americans in general. This was determined by comparing answers to questions in which half the respondents were asked about Asian Americans and half about Chinese Americans. This might not be surprising considering that there are 26 Asian nationalities, and Chinese Americans are the oldest and largest segment of the Asian American population and thus more familiar to Americans. However, for some questions it is clear by the divergent responses that some respondents could tell the groups apart, as for example those individuals who had frequent interactions with Chinese or Asian Americans. The general public also was asked two questions of knowledge not asked of the Chinese American sample . Twenty-three percent of the general public was able to guess that Asian Americans make up about 5% of the U.S. population, with 84% overestimating Asian American numbers. Only 8% of Americans correctly guessed the percentage of Asian Americans who are American-born (30%), but it is possible that most Chinese Americans would have not known this number either. What is most striking is that Chinese Americans largely believe that they are still seen as the “Other,” and overestimate the negative views of the general population toward them. Their perceptions could be influenced by experiences of discrimination, which the survey shows the general public for the most part did not perceive as a big problem for Chinese Americans. Chinese Americans described an array of experiences in which they were treated unfairly, with nearly three in five (58%) reporting such treatment. Most common was verbal harassment (39%), followed by disrespect or poor service (27%), general unfair treatment (16%), unfairness in career progression (8%), stereotyping (8%), glass ceiling (7%) and unequal pay (6%). A few even reported physical harassment (5%). Interestingly, those more likely to report experiences of verbal harassment are American-born (59% of Chinese Americans born here have experienced this) while those reporting disrespect or poor service are more likely to be those born in China (39% have had this experience). There was a stark contrast between how the general public’s overall feelings toward Chinese Americans and Chinese Americans’ estimate of how other Americans viewed them. While the general public had a mean favorability score of 80 toward Chinese Americans, with 100 as an extremely positive feeling and 1 as an extremely negative, Chinese Americans, when asked to estimate the score that other Americans would give them on the same scale, guessed 64. It might be noted that the general public showed a slightly higher degree of favorability toward different races, ranging from 78 to 83, than the Chinese Americans, whose ratings were at a lower level, from 72 to 78. A general question about the amount of discrimination Asian Americans faced showed less divergence. Sixty-nine percent of Chinese Americans believed that Asian Americans faced some or a lot of discrimination, with 63% of the general public sharing that view. However, when looking at specific areas of discrimination such as racial profiling, equality in the workplace and in higher education, or political influence, Chinese American opinion differed significantly from that of the American public. 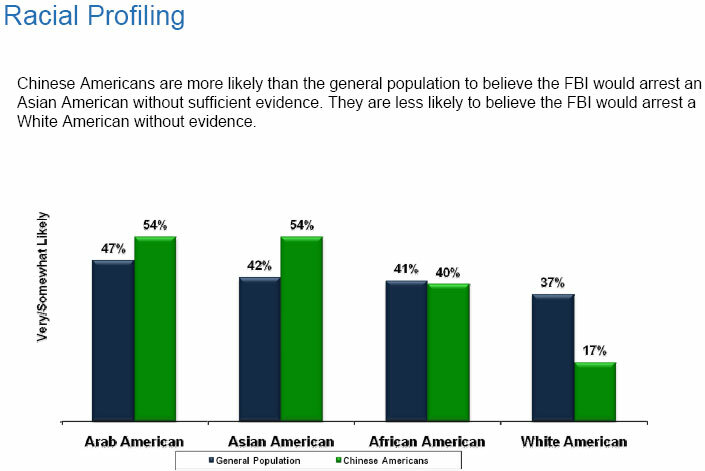 • 54% of Chinese Americans believed an Asian American was as likely as an Arab American to be arrested by the FBI without proper evidence. Only 42% of the public thought that Asian Americans would face this situation, compared to 47% believing this could happen to Arab Americans. • 82% of Chinese Americans believe Asian Americans have too little power and influence in Washington, whereas only 47% of the public hold this view. • Only 29% of Chinese Americans think that Asian Americans are promoted to higher ranks of management at the same pace as White Americans, an opinion held by 46% of the general public. • Only 23% of Chinese Americans feel that Asian Americans are adequately represented on corporate boards, while twice as many in the public sample, 50%, think they are. • 45% of Chinese Americans say that Asian American students are adequately represented on college campuses, compared to 65% of the general public who feel they are. Are Chinese and Asian Americans still the “Other”? No, in the sense that American tolerance of other races, and of Asian American immigrants, has increased since 2001. There also have been gains in the public’s favorable attitudes toward both Chinese Americans and Asian Americans. But, the answer is yes when one looks at the large minority of the general public with negative views of Asian Americans, and when the Chinese American side of the story is heard, with its experiences of unfair treatment and its prevalent concerns that much improvement that is needed before Chinese Americans win true equality in American society. Im not that much of a reader to be honest but your blogs pretty good, keep it up as I will bookmark ready for my next read.. The "one fifth to two fifths" you are referring to "who feel that Asian Americans have too much influence in government" is inaccurate. The survey results were that 36% of Americans feel that Asian Americans have just the right representation in government, meaning their participation is proportionate to their population. Big difference.